There is something so nostalgic about summer that I can never quite put my finger on. Perhaps it’s a feeling leftover from a girlhood obsessed with the glamorous 1920’s Atlantic City “Diving Girls” riding horses off sixty foot platforms into pools of water with enthusiastic crowds cheering them on. Every summer I look for that sense of nostalgia—that same feeling that makes us play boardwalk games and eat ice cream from cones even though we know they’ll melt down our hands before we can take a second lick. This summer I went looking for that nostalgia and found it at Rockaway Beach. 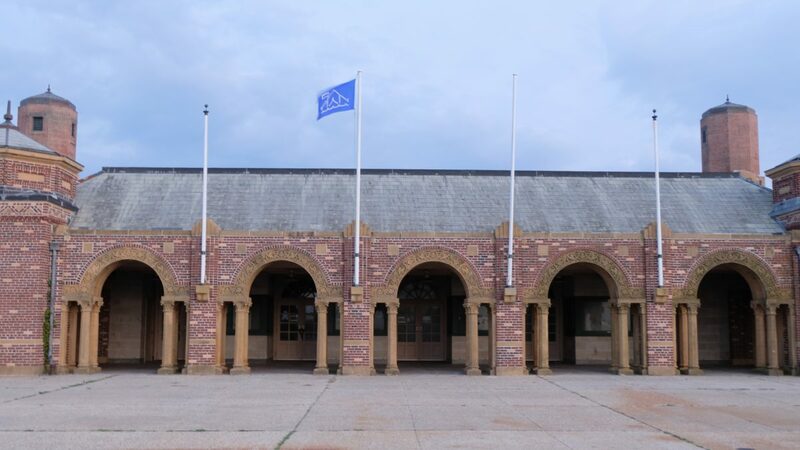 A revitalizing, increasingly buzzing beach community a ferry ride away from lower Manhattan, the Rockaways are rising with a nod to their centuries old glory and with a firm eye on their post-Sandy future. 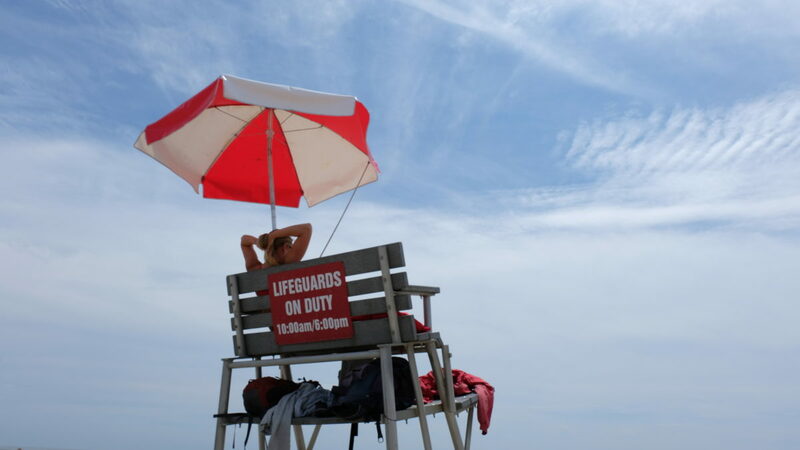 At one time the most popular beaches in America, the Rockaways have a long history of playing host to thousands pouring in for the ocean water and boardwalk, all within a stone’s throw from the urban madness of New York. 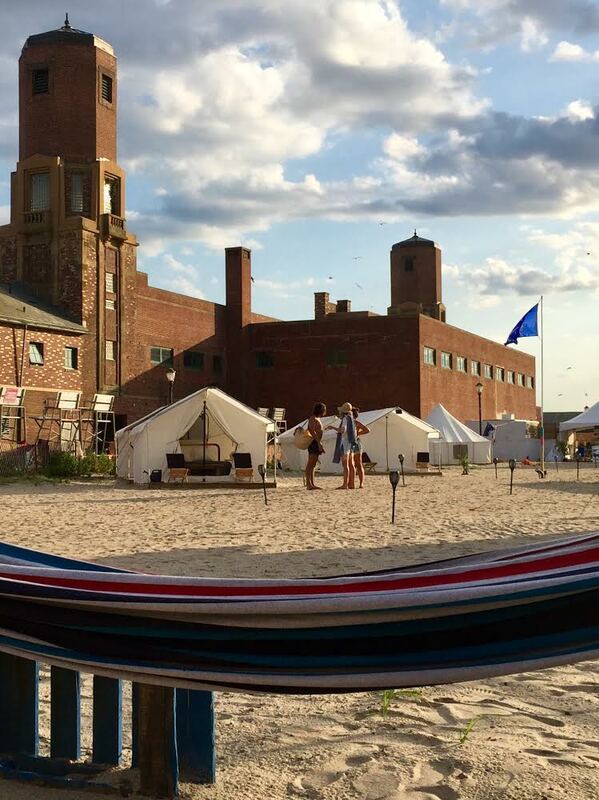 Although close enough to visit for the day, there is nothing quite like a summer getaway that includes a night away, a fact that fueled the creation of the new Camp Rockaway, a summer glamping experience right off the boardwalk and within the courtyard of the old Jacob Riis Bathhouse. 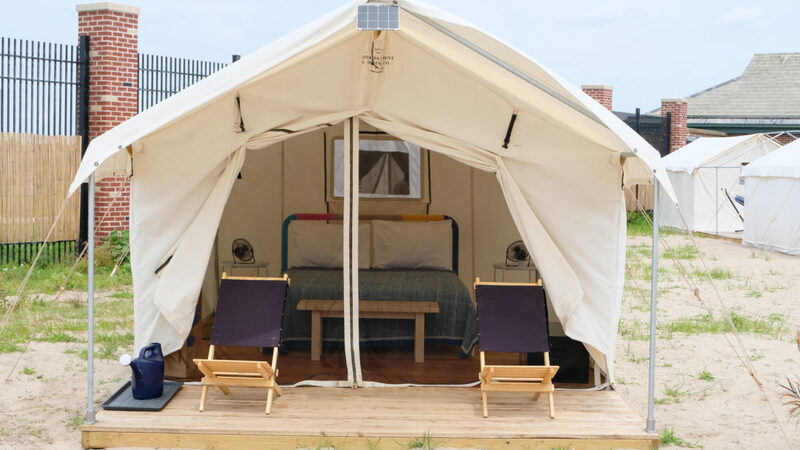 One of latest spots in New York’s obsession with getting back to nature while maintaining some of the comforts of home, Camp Rockaway is a compound of twelve safari tents outfitted with real beds with memory foam mattresses, hammocks, and solar powered showers, fans, lights and chargers. 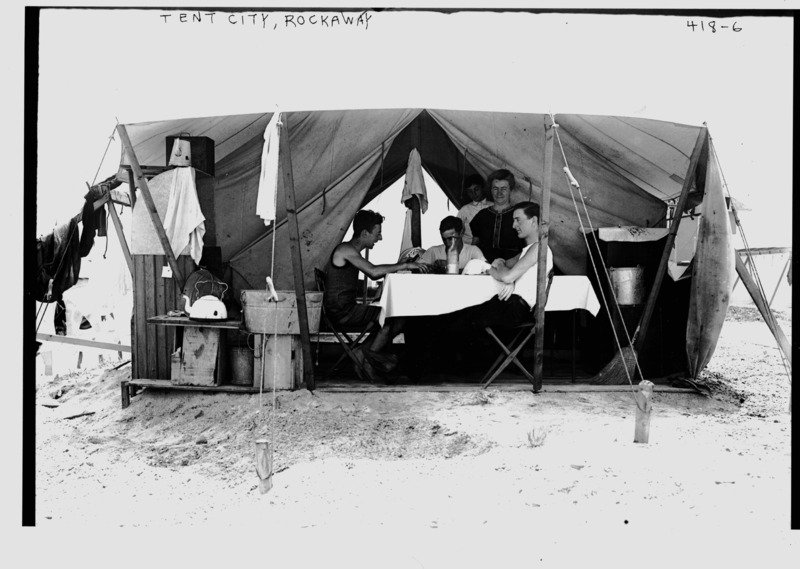 Camp Rockaway is the brainchild of Kent Johnson, an architect inspired by the tent colonies of beach days long past. 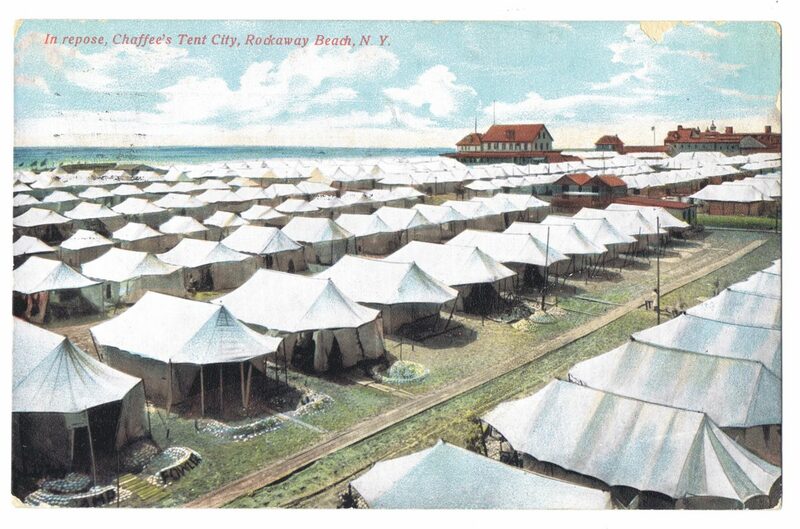 Moved by the history of the Rockaways, from the days of grand boardwalk hotels and robust tent colonies, Johnson drew inspiration from the timeless nature from old photographs from the early days of the Rockaways’ heydey. What he’s created is an experiment in timeless beach camping. 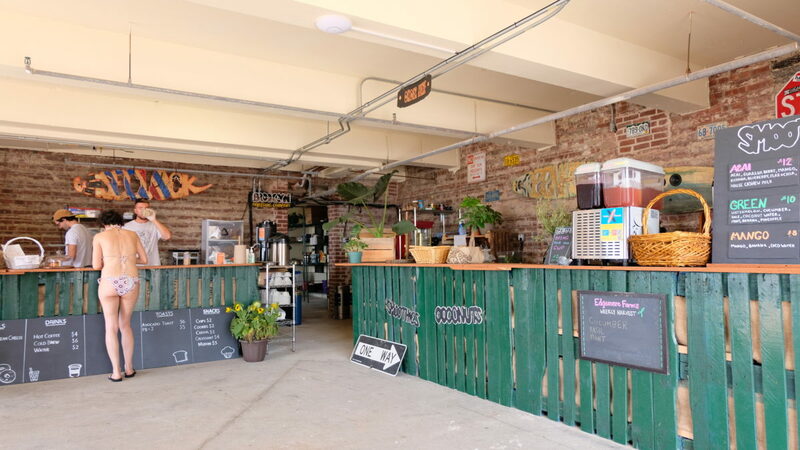 A long planned dream, Camp Rockaway had its first run last summer with a five week pop-up, and opened more permanently this year after Memorial Day and plans to stay open through Halloween night. (They’ve already planted their pumpkins in anticipation.) Johnson hopes to keep the Camp in the bathhouse courtyard or at nearby Fort Tilden, the bathhouse’s more wild neighbor. As more and more young people come out from the city to revitalize the 1930’s bathhouse (which reopened this summer after being long abandoned) and boardwalk into a series of eateries—think poké, organic smoothies, and gourmet hot dogs—the very nature of the place is constantly evolving. Where the Rockaways’ charm lies, however, isn’t solely in the new hipster-drawing pull of its new establishments, but in its strongholds to the past. The bartender who serves me a local IPA recommends a bar that night which is the hangout for local policeman and fireman. Well bronzed teenage lifeguards work out with rusted weights behind the bathhouse. This is American summer at its finest—classic with a twist. 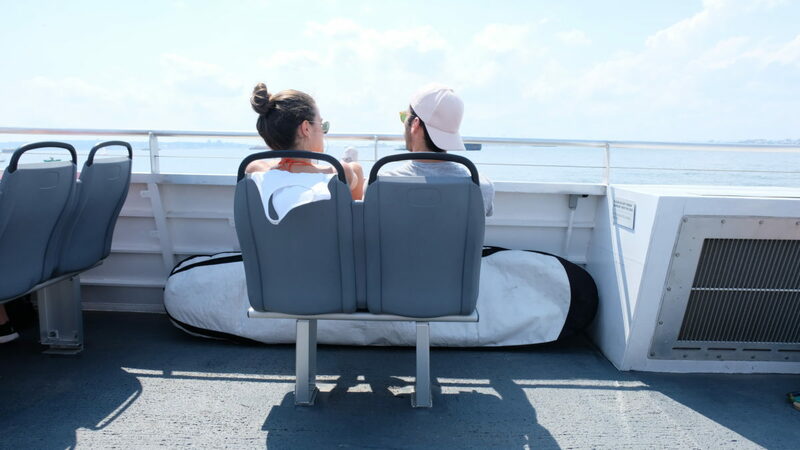 In creating Camp Rockaway, Johnson created a dream that he hopes will move people to explore the peninsular, whether by swimming or surfing in the ocean, exploring MoMA’s pop-up at nearby Fort Tilden, discovering some of the best food outside of the city (don’t miss Uma’s), or to simply marvel in the Rockaway’s natural beauty. 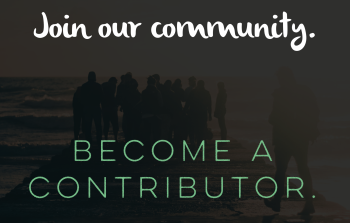 In addition to beach clean-ups, Camp Rockaway is planning fireside chats with partners such as the National Park Service, Patagonia Bowery, and the Black Surfer’s Alliance to educate guests about what can be done to reduce our impact on the ocean and environment as a whole. Within an hour I’m transported from this environment back to the urban jungle via an express ferry to Wall Street. I stare wide-eyed at the lower Manhattan skyline, continually awed by the city and its magnitude. But it’s the beach I’m thinking of. And I’m already nostalgic for it. About the author: Madeline Weinfield is a New York-based writer and the community editor of The Culture-ist. Follow her adventures @madolionw.